Mathews County is located on the eastern tip of Virginia’s Middle Peninsula. The County’s rural setting, traditional architecture, small towns and numerous waterways give the place the feeling of true Chesapeake Bay country. Although you’re not very far from the more urban areas of Richmond, Williamsburg and Newport News, you’ll find that here, everything is a bit more relaxed. No rush hour and no traffic jams (no traffic lights, even!). Mathews County was established in 1791 and the area played a role in history even prior to that. In the 1776 Battle of Cricket Hill, Lord Dunmore’s defeat at Gwynn’s Island marked the end of British rule in Virginia. Mathew’s long history in shipbuilding also played a role in the nation’s history, with many of the Continental Navy’s ships constructed there during the Revolution. Much of the area’s history is still in evidence today. The County’s courthouse has been in continuous service since it was constructed in the 1790’s. Several 18th Century homes still exist in Matthews and remain in use. 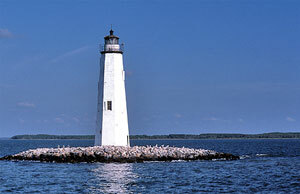 And the New Point Comfort Lighthouse, constructed in 1805, is the third oldest lighthouse in the Chesapeake Bay. Mathews likes to point out that they’re the second-smallest county in Virginia. But thanks to miles and miles of shoreline, a wealth of history and plenty of creative residents, this tiny county provides quite a bit to keep a visitor busy. A good place to start before you head off to explore Mathews is the Visitor & Information Center located in historic Sibley’s General Store, 239 Main Street, in downtown Mathews. Summer hours are 10:00am to 4:00pm Monday – Saturday and Noon to 3:00 on Sundays. In addition to maps, brochures and community event information, you’ll find a selection of gifts and arts & crafts for sale as well as exhibits of historical and local interest. This is also where you can purchase your Mathews Driving Tour Package which includes three detailed driving tour maps and a walking tour of the historic court area. Take a look inside the visitor center. The Mathews Courthouse Square in downtown Mathews is listed on both the Virginia Landmarks Register and the National Register of Historic Places. The Square includes the courthouse, which was constructed in 1795, a debtors jail constructed circa 1795 and the Clerk’s Office, circa 1859. The Historic Tompkins Cottage, located on Brickbat Road adjacent to the Mathews Courthouse area, was owned by Christopher Tompkins, who was the father of Sally Tompkins, a philanthropist and nurse during the Civil War who’s work with a Richmond military hospital lead to her being the first female commissioned officer in the U.S. military. Tompkins Cottage now serves as headquarters for the Mathews County Historical Society. The cottage houses changing exhibits and a collection of objects typical of a home of the period (circa 1815). The cottage is open to the public on Fridays from 10:00am to 1:00pm and Saturdays from 9:00am to 1:00pm, April through October. The cottage shop has books, posters and other items related to the history of Mathews County and the Chesapeake Bay region. While you’re in downtown Mathews, pay a visit to the Mathews Art Group’s Gallery located at 206 Main Street. The gallery is open Monday – Saturday 10:00am to 4:00pm. The gallery is the project of a cooperative of over 100 Mathews artists and lovers of art and features locally-produced fine art and fine crafts. If you’re downtown on a Saturday, be sure to check out the Mathews Farmers Market on the Courthouse Square. The market is open from 9:00am to 1:00pm, April – October and features fresh local produce, baked goods and handcrafted items. For a small community, Mathews has a nice selection of museums. The Gwynn’s Island Museum houses an impressively extensive collection of artifacts representing the history of the area. Two floors of exhibits give you a glimpse of what life in this area was like in earlier days. 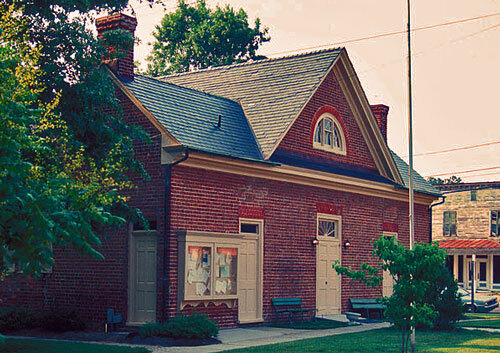 The Gwynn’s Island Museum is open on Fridays, Saturdays and Sundays 1:00 – 5:00pm April through October. The Mathews Maritime Museum has a collection of artifacts, documents and photographs depicting area’s maritime history. The Maritime Museum is located in downtown Mathews at 482 Main Street. They’re open on Fridays and Saturdays, 10::am to 2:00pm from April to November. They also operate Gwynn’s Island Boat Shop, where work is done on their antique boat collection. All the waterways surrounding Mathews County makes it a great place for exploring in a kayak or canoe. A series of blueways water trails have been developed to help you find the best places to do some paddling. There are five different trails – Piankatank River Trail, Gwynn’s Island/Milford Haven Trail, Winter & Horn Harbor Trail, New Point Comfort Trail, and East River Trail. You can purchase a copy of the Mathews Blueways Water Trails Guide at the Mathews Visitor and Information Center, or they’ll send you a copy if you’re willing to pay a little extra. If you don’t plan on bringing your own kayak to Mathews, you can rent one from Mobjack Kayaking. If you enjoy birdwatching, there’s a Mathews Loop on the Virginia Birding and Wildlife Trail. The loop includes nine waterfront birding spots where you can find a variety of shorebirds as land birds in the adjacent upland areas. While you’re out exploring, try to catch a glimpse of the New Point Comfort Lighthouse, the third oldest surviving lighthouse in the Chesapeake Bay and the tenth oldest in the United States. The light stands at the entrance to Mobjack Bay. The island that the light was constructed on has been mostly lost to hurricanes and storms and the lighthouse is in danger of being lost. The New Point Comfort Lighthouse Preservation Task Force has been established to develop a plan save the lighthouse. The lighthouse can be seen best from the water but is visible from shore at the New Point Comfort Observation Walkway located at the southern end of Route 600. Check out the Visitor Center’s list of restaurants and coffee shops for the most up-to-date information on places to eat. For entertainment, there’s Donk’s Theater, home of Virginia’s Lil Ole Opry. Donk’s is a family-friendly establishment that presents Opry-style country music shows with a variety of acts scheduled for every-other Saturday night. See their show schedule. Donk’s is located at the intersection of Route 198 and Route 223. Southwind Pizza, located at 44 Church Street in downtown Mathews, has live music every 2nd and 4th Saturday of the month, starting at 8:00pm. The White Dog Bistro, also located in downtown Mathews, across from the historic courthouse, has live music every Friday and Saturday night on the Portside Deck. If you’ll be arriving by boat and need a place to dock, you’ll find plenty of marinas spread out around the county’s many waterways. The Mathews County Visitor Center website has a list of marinas. 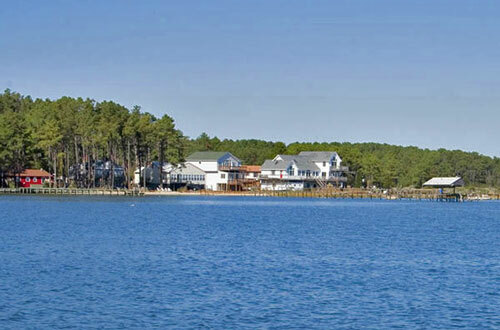 Blue Water Haven Waterfront Inn – Located on Stutts Creek, just off the Chesapeake Bay. There’s a swimming pool and a private boat ramp. Three suites available. Buckley Hall Inn – Bed & breakfast in a restored 1850 Georgian home. Located in Mathews Courthouse. Inn at Tabbs Creek – A waterfront bed & breakfast. The Inn at Tabbs Creek is a certified Virginia Green lodging establishment. You can fish or crab off the Inn’s private dock or rent one of the Inn’s kayaks or stand-up paddle boards to get out on the water. Mathews County Tourism. Official visitor information for Mathews County, Virginia. Mathews County website – Official Mathew County website with government services and information for residents, businesses and visitors. Mathews County Historical Markers – A nice convenient way to read the roadside historical markers of Mathews County.